Do you hold on to extra clothes that you don’t really like because you need them as backup for days when there’s no clean laundry? If so, then you may have a laundry problem. Do you have two baskets in your bedroom — one for dirty clothes and one for clean? If so, then you may have a laundry problem. Are you afraid that someday you will find yourself in the E.R., explaining to the triage nurse that you sprained your ankle while stepping over piles on the laundry room floor? If so, then you may have a laundry problem. 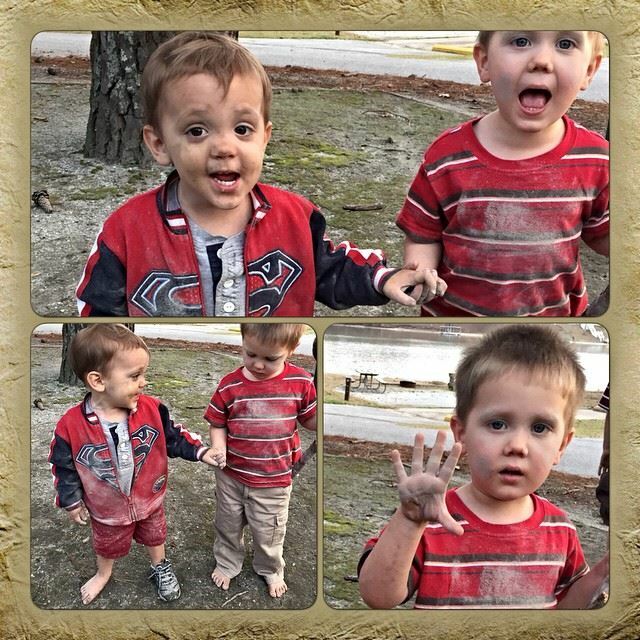 As our family has grown, so has our laundry pile, and it can be frustrating! A mountain of laundry can quickly become a monster, take over your house and ruin everyone’s mood. It can create tension and silly drama as you dig through piles of clothes trying to find something to wear. It definitely creates Mom Guilt. Mom Guilt is something that happens when you see big piles of laundry on the floor, your kids running around in wrinkled clothes that they pulled out of a stack on top of their dresser, and mommy blogs with cute printable lists of how to organize your life better so that you don’t have a laundry problem. I hate those lists. They make me feel worse. If only I was more organized, I would stick to a list and my house would be perfect with no piles. So why am I writing one of those cute but wretched little lists? Because, I feel like a laundry problem isn’t so much of an organizational problem as it is a having-too-much-stuff problem. Not everybody has the luxury of being completely organized and on top of their game. That’s just life. But anybody who has the luxury of having a laundry problem, has the luxury of being able to get rid of stuff. Over the course of the last 10 months, I accidentally discovered three steps to conquering this laundry monster. Have I completely conquered it myself? No. But it has gotten significantly less menacing. In fact, we only spend about 3 hours a week on laundry. If I could just discipline myself enough to get the clean clothes put away in a timely manner, well, then, I will have conquered the laundry monster. Is this the only way to solve the problem? Probably not. This is just what we did and it probably isn’t for everybody. But if you are desperate to crawl out from underneath that heavy, smelly, smothering laundry pile–then read on. Get rid of 75% of your clothes. I know, 75% sounds like an extreme number but it is absolutely doable! Most of us have clothes in our closets that we haven’t worn in years, or are keeping until we fit into them again. Maybe you bought a skirt or five on clearance one day, but never found the right shirts to match. Maybe somebody gave you a bag of clothes for your kids to grow into, but they grew out of them before you remembered to go through them. Maybe your husband has 37 old ties that he never wears because they have pictures of Bugs Bunny on them. Maybe you grew up poor and the fear of not being properly dressed has caused you to become a clothes hoarder. In reality, the average person only needs 7-10 complete outfits, 2-3 sets of pajamas, enough underclothing to last a week, and shoes to match. I’ll go even further. 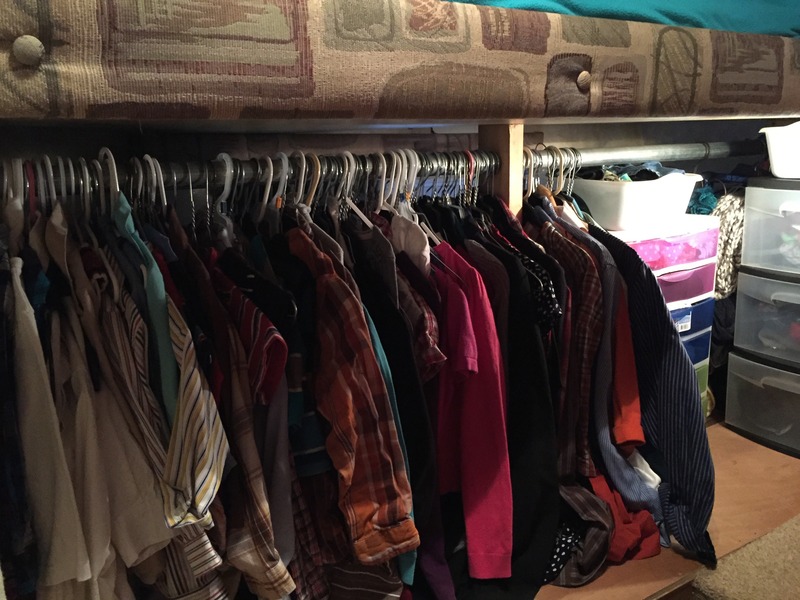 A family of six should be able to fit all of their necessary clothes in one standard American clothes closet. There was a time that this sounded absolutely crazy to me. I like clothes. I like kids’ clothes. Shopping is fun. I was afraid that there would be a day that I would have to dig clothes out of the dirty laundry because we didn’t have enough “back-up” clothes. 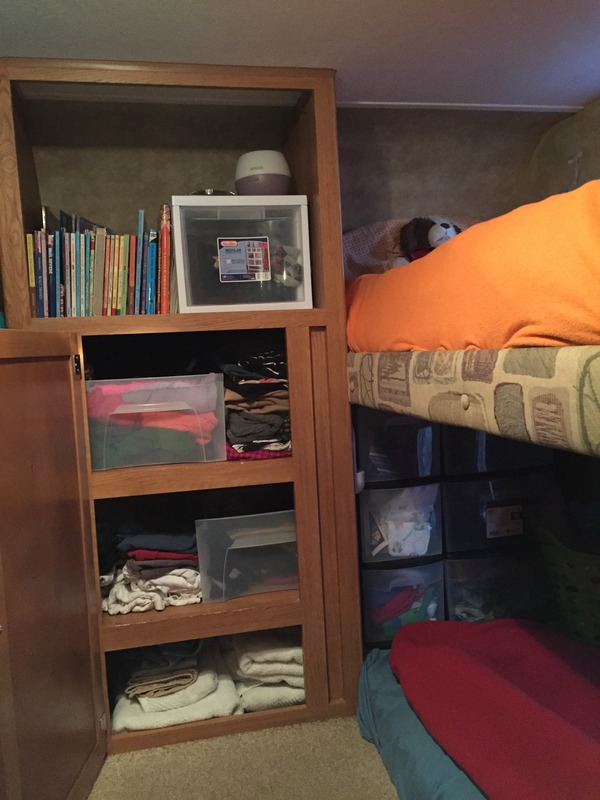 When we moved into our camper, I had no choice but to get rid of 75% of our clothes. It was a difficult thing to do, but wow, was it liberating! I don’t miss any of those clothes. I don’t miss the stress of them either. 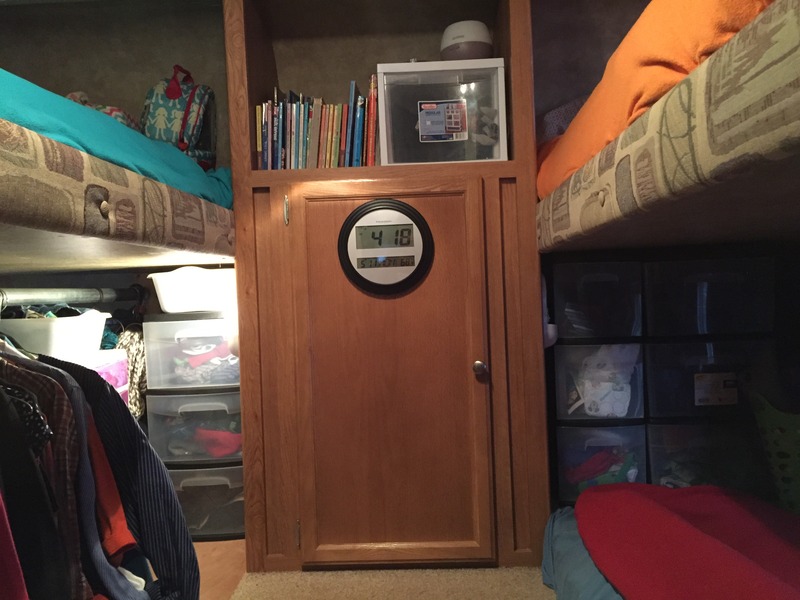 We only have to do laundry once or twice a week–about 3-4 loads. Every piece of clothing (except Adam’s suits) in our family fits in this space and we STILL have more clothes than we actually wear. Try it. Don’t let those clothes boss you around anymore! Be the boss! Keep only what you love. Throw everything else in trash bags and load them immediately in the back of your car. The next time you drive by a donation center, drop them off and breathe a sigh of relief at how much lighter you feel. I promise, you will not be sorry. This one is optional, but I thought I’d throw it in here because it really works for us! 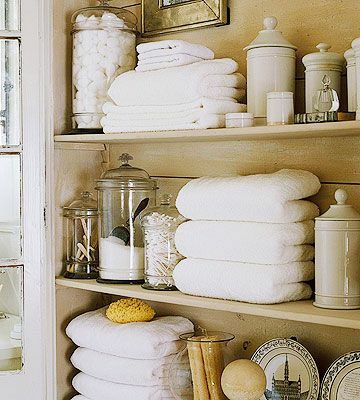 Switching to classic all-white bath and kitchen towels not only creates a more open and airy feel in the space, but it simplifies your laundry as well. You can now wash all of your whites and towels together in one load, creating less laundry. Each member of our family has one bath towel, hand towel, and wash cloth. We have one extra of each. We also have one kitchen towel and wash cloth for each day of the week, plus one extra of each. This has been sufficient for us. When we move into a normal house again, I do plan on having a few more extra towels, but only a few! Why load myself down with unnecessary work? I’m still working on this one, but–laundry is a blessing. Stop laughing, I’m serious. The fact that you have more clothes than you know what to do with is certainly nothing to complain about. You’re never going to get rid of laundry. It’s always going to be there. Forever. As long as you are alive, you will have laundry. So, be glad you’re alive and let those dirty clothes serve as a reminder of a life lived well.